(Nanowerk News) Using a new type of dual polymer material capable of responding dynamically to its environment, Brown University researchers have developed a set of modular hydrogel components that could be useful in a variety of "soft robotic" and biomedical applications. The components, which are patterned by a 3D printer, are capable of bending, twisting or sticking together in response to treatment with certain chemicals. For a paper published in the journal Polymer Chemistry ("3D Printed Self-Adhesive PEGDA-PAA Hydrogels as Modular Components for Soft Actuators and Microfluidics"), the researchers demonstrated a soft gripper capable of actuating on demand to pick up small objects. 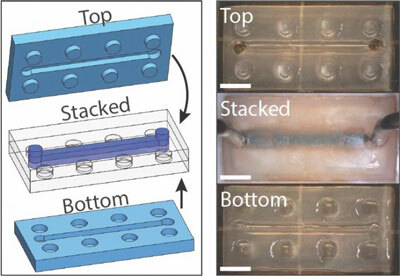 They also designed LEGO-like hydrogel building blocks that can be carefully assembled then tightly sealed together to form customized microfluidic devices -- "lab-on-a-chip" systems used for drug screening, cell cultures and other applications. The key to the new material's functionality is its dual polymer composition, the researchers say. "Essentially, the one polymer provides structural integrity, while the other enables these dynamic behaviors like bending or self-adhesion," said Thomas Valentin, a recently graduated Ph.D. student in Brown's School of Engineering and the paper's lead author. "So putting the two together makes a material that's greater than the sum of its parts." Hydrogels solidify when the polymer strands within them become tethered to each other, a process called crosslinking. There are two types of bonds that hold crosslinked polymers together: covalent and ionic. Covalent bonds are quite strong, but irreversible. Once two strands are linked covalently, it's easier to break the strand than it is to break the bond. Ionic bonds on the other hand are not quite as strong, but they can be reversed. Adding ions (atoms or molecules with a net positive or negative charge) will cause the bonds to form. Removing ions will cause the bonds to fall apart. For this new material, the researchers combined one polymer that's covalently crosslinked, called PEGDA, and one that's ionically crosslinked, called PAA. The PEGDA's strong covalent bonds hold the material together, while the PAA's ionic bonds make it responsive. Putting the material in an ion-rich environment causes the PAA to crosslink, meaning it becomes more rigid and contracts. Take those ions away, and the material softens and swells as the ionic bonds break. The same process also enables the material to be self-adhesive when desired. Put two separate pieces together, add some ions, and the pieces attach tightly together. That combination of strength and dynamic behavior enabled the researchers to make their soft gripper. They patterned each of the gripper's "fingers" to have pure PEGDA on one side and a PEGDA-PAA mixture on the other. Adding ions caused the PEGDA-PAA side to shrink and strengthen, which pulled the two gripper fingers together. The researchers showed that the setup was strong enough to lift small objects weighing about a gram, and hold them against gravity. "There's a lot of interest in materials that can change their shapes and automatically adapt to different environments," said Ian Y. Wong, an assistant professor of engineering and the paper's corresponding author. "So here we demonstrate a material the can flex and reconfigure itself in response to an external stimulus." But potentially a more immediate application is in microfluidics, the researchers say. Hydrogels are an attractive material for microfluidic devices, especially those used in biomedical testing. They're soft and flexible like human tissue, and generally nontoxic. The problem is that hydrogels are often difficult to pattern with the complex channels and chambers needed in microfluidics. But this new material -- and the LEGO block concept it enables -- offers a potential solution. 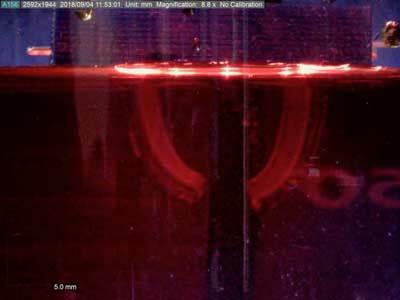 The 3D printing process allows complex microfluidic architectures to be incorporated into each block. Those blocks can then be assembled using a socket configuration much like that of real LEGO blocks. Adding ions to the assembled blocks makes a water-tight seal. "The modular LEGO blocks are interesting in that we could create a prefabricated toolbox for microfluidic devices," Valentin said. "You keep a variety of preset parts with different microfluidic architectures on hand, and then you just grab the ones you need to make your custom microfluidic circuit. Then you heal them together and it's ready to go." And storing the blocks for long periods before use doesn't appear to be a problem, the researchers say. "Some of the samples we tested for this study were three or four months old," said Eric DuBois, a Brown undergraduate and co-author on the paper. "So we think these could remain usable for an extended period." The researchers say they'll continue to work with the material, potentially tweaking the properties of the polymers to get even more durability and functionality.